Even by their tireless standards (they’ve released 17 albums in 15 years), 2011 has been a very busy year for Japanese noise-rockers Boris, with the release of three albums and a supporting world tour. 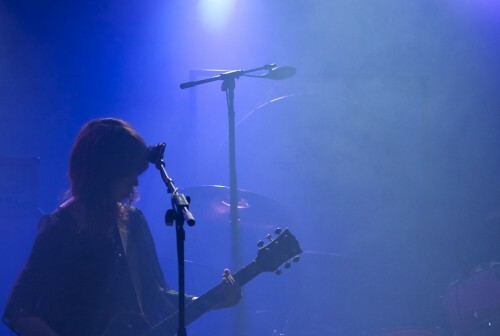 Of the three albums the band has dropped this year, two dipped into Isn’t Anything-era My Bloody Valentine noise-pop, mostly eschewing the heavy psychedelic drone of their extensive back-catalog for a more accessible sound. On the final date of their HOPE World Tour, Boris played to a mostly sold-out crowd at Hollywood’s El Rey Theatre Saturday evening, with support coming from Tera Melos and Early Graves. More than anything else, Boris’ career has been defined by a certain restlessness, an inability to get too comfortable with any particular genre, leaving many fans by the wayside between the many seismic shifts they have undergone in their 19 years together. Taking their name from a Melvins song, the band’s early work consists mostly of extended doom-metal pieces until the molten stoner punk of 2002’s celebrated Heavy Rocks. Since then, Boris has tried their hands at nearly every variation of metal and psych-rock known to man, opened for Nine Inch Nails, and helped soundtrack a Jim Jarmusch film. In recent years, the band has drawn heavily on ’90s shoegaze, which they’ve proven especially good at while still retaining all of their famed, ferocious edge: The dream-poppy Attention Please dropped on the same day as Heavy Rocks (II), a likely successor to the aforementioned 2002 barnburner. Boris leaned heavily on their 2011 output Saturday night, playing four and three songs each off of Heavy Rocks (II) and Attention Please, respectively. The set’s first half mostly consisted of the aforementioned dream-pop, with guitarist Wata singing lead on “Attention Please” and “Party Boy” as she strummed reverbed-out chords. 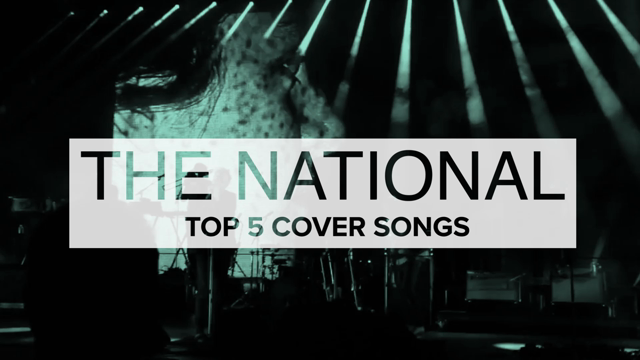 Just as they hit their most upbeat note with the positively cheery “Spoon” though, the band changed gears, breaking into the thunderous rumble of “Missing Pieces”, a sprawling highlight off of Heavy Rocks (II). Boris’ fearless leader, drummer, and occasional lead vocalist Atsuo held it all together, making it look ridiculously easy as he struck at the gong behind him during the song’s contemplative intro, pounded away at his kit as it picked up speed, and effectively made clear why he’s renowned as one of the world’s most dynamic drummers. 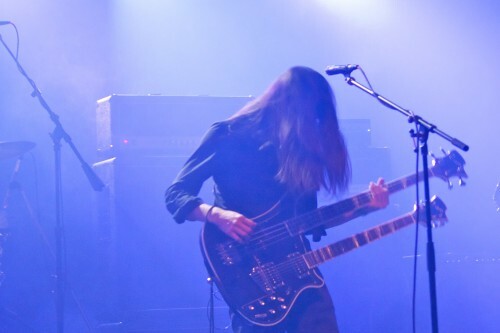 Frontman Takeshi, on the other hand, was composure personified, all subtlety and restraint even as he alternated between playing bass and trading fuzzy solos with Wata and touring guitarist Michio Kurihara on his double-neck guitar/bass. His lightning-quick lead lick on “Pink” won Boris their loudest cheers of the night and inspired a couple of good old-fashioned circle pits. Indeed, it’s a mark of Boris’ talent just how much they’ve managed to rile up a near-capacity crowd in Hollywood with only a handful of heavy tunes and a couple words of broken English.